One of the most innovative, provocative, and influential of America's contemporary artists, Bruce Nauman spent his formative years in Northern California—first as a graduate student at the University of California, Davis, then living in and around San Francisco. This splendidly illustrated book explores Nauman's relationship to the place where he created his earliest and most strikingly original works during the mid to late 1960s. 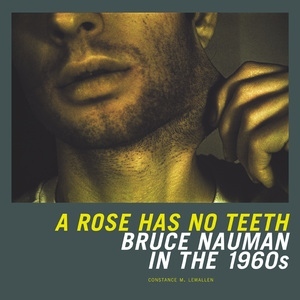 A Rose Has No Teeth demonstrates that Nauman established much of his artistic vocabulary during this period and that he laid the groundwork for fundamental ideas he addressed throughout his oeuvre, such as the role of the artist, the function of art, and the primacy of the idea over its form. Curator Constance M. Lewallen describes how the late 1960s were not only a time of political and social change in the San Francisco Bay Area; this was also a watershed period in art internationally, when Minimalism gave way to Post-minimalism and Conceptual Art, expanding into performance, film and video, installation, text works, and the photographic documents. This book shows that Nauman was at the forefront of these revolutionary changes and almost single-handedly redefined what it meant to be an artist. Constance M. Lewallen is Senior Curator for Exhibitions at the Berkeley Art Museum and Pacific Film Archive and author of Ant Farm, 1968-1978; The Dream of an Audience: Theresa Hak Kyung Cha (1951-1982), both from UC Press; Everything Matters: Paul Kos, A Retropective; and Joe Brainard: A Retrospective. Robert Riley, independent curator and writer concentrating on contemporary media and time-based Arts, served as Founding Curator of Media Arts at the San Francisco Museum of Modern Art 1986-2000. Robert Storr is a critic, artist, and Dean of the School of Art at Yale University. Anne Wagner is Professor of Modern Art at the University of California, Berkeley.